The Bournemouth Marathon starts in Kings Park before making its way down onto the seafront. You continue to take in the beautiful coastal views as you hit mile 9 on the coastal marathon route. Standing midway between Poole Harbour and Hurst Spit, Hengistbury Head forms the main division between Poole and Christchurch bays. 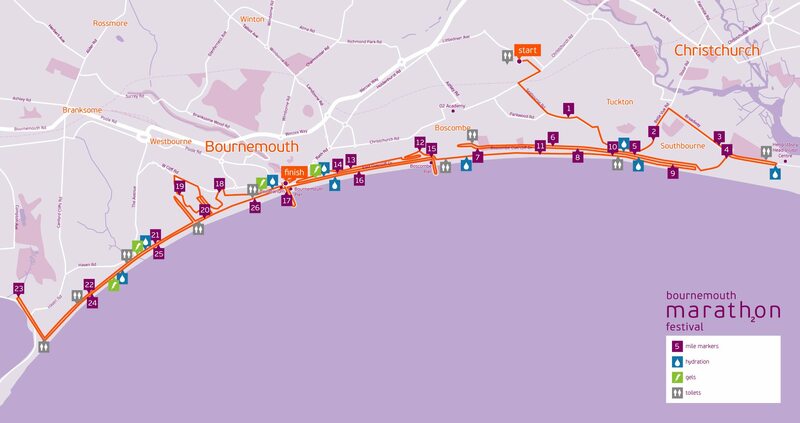 You then turn west and at mile 14 you can see the famous Russell-Cotes Art Gallery & Museum which is situated on Bournemouth’s stunning cliff-top, over looking the sea. You then continue to run along the seafront, taking in the breathtaking Boscombe Pier, at mile 12 & 16. As you hit the iconic Bournemouth Pier for the second time, you know you’re on the home stretch. The Pier was first constructed in 1856. As you continue your run west towards Lower Gardens at mile 18, you then head towards Poole’s Natural Harbour which is the largest in Europe before taking in the last few miles along the stunning sea front and finishing in Lower Gardens. A great Marathon race. course a little hillier than I thought but fabulous atmosphere and more toilets than I have ever seen at any marathon ever! I will be back again in 2018. Great course and organisation. Weather will always be a factor on a coastal marathon - 2017 was a fab year with no wind and warm weather but a strong wind along the coast will mean tricky pace judgement. There are more hills than you would expect - some killers in the 2nd half, mainly due to short steepness rather than duration. The organisers provide everything you need in the build up and during the event. It was my first marathon so it was pretty emotional. Great event, brilliant organisation. The hill at 17/18 makes you cry, but the beach makes you smile. Really well organised event. Good course which takes you along the sea front on a few occasions. A couple of hills to her over which are a bit testing. I will definitely do it again. Well organised, friendly helpful Marshalls, good crowd support in the centre of Bournemouth. Mentally tough to go under finish gantry at half way, but once through you can focus on the finish - as you know what to expect!